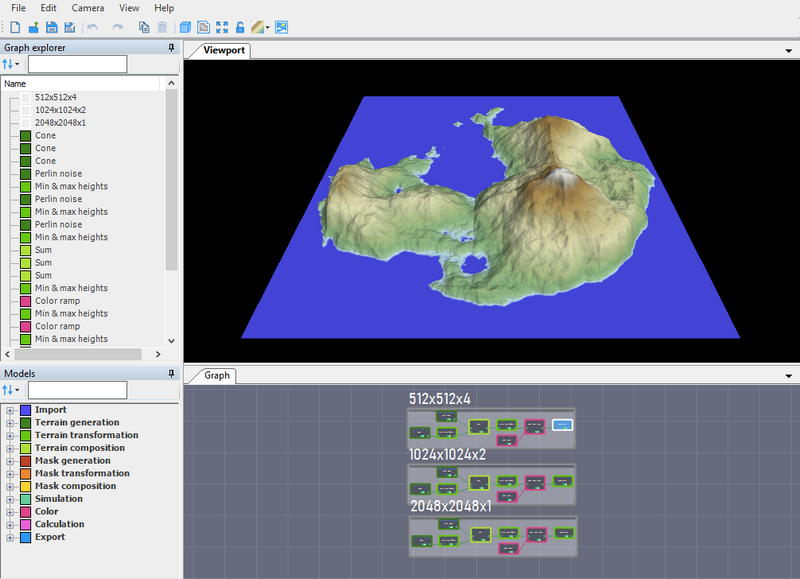 This sample presents a simple project that generates an island. It is used to test the performance of Instant Terra with terrains of different sizes. The first graph generates terrains of size 2048 x 2048 with a resolution of four meters. The second graph generates terrains of size 4096 x 4096 with a resolution of two meters. The third graph generates terrains of size 8192 x 8192 with a resolution of one meter. This project generates two terrains from a Perlin noise and a cone, and composes them together to create the island. A specific color ramp is created. The last operation uses a curve to slightly modify the relief, especially on the coast. Changing the Perlin noise parameters changes the relief of the island; changing the angle of the cone of the cone changes its size.